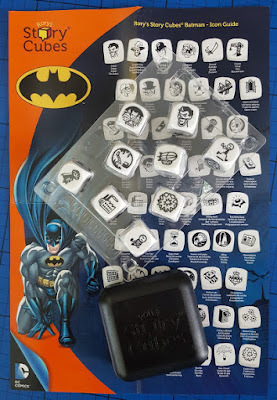 The Brick Castle: Rory's Story Cubes Batman Edition Review (age 6+). Rory's Story Cubes Batman Edition Review (age 6+). Rory's Story Cubes are a genius invention that helps expand a child's vocabulary, imagination and understanding of the world through storytelling. Nine small plastic cubes with a different picture prompt on each side, giving you a million possible combinations and infinite adventures. We've been sent the brand new Batman edition cubes to play with. 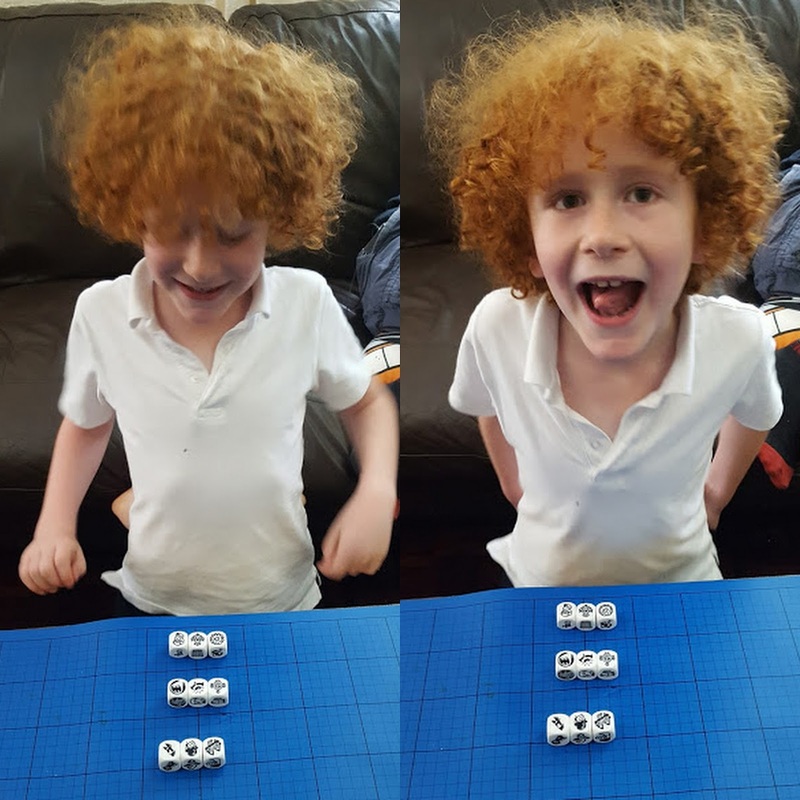 My boys haven't seen Rory's Story Cubes before, but they both adore stories and storytelling, so I knew they'd be a hit. They are both also very keen on Batman - double hit. Suitable especially for age 6+, inside the box we have the 9 story cubes, rules of play and a carrying case. The plastic storage case is a brilliant addition and very minimal and neat. I think we'd probably have lost at least 2 of the story cubes by now without it. You really are onto a winner with a toy that comes with it's own storage. The main game is simply to create a story using the 9 story cubes, as your child grows into it, they will make it more complex and intricate. There are no rules as such, the cubes can represent whatever relevant item or event the storyteller wishes. The open window shown in the picture above could be a way to escape or gain entry, a breeze blowing through, it could depict a building, it could be someone waking up and throwing open the shutters. It can be a part of the story in whatever way suits the storyteller. 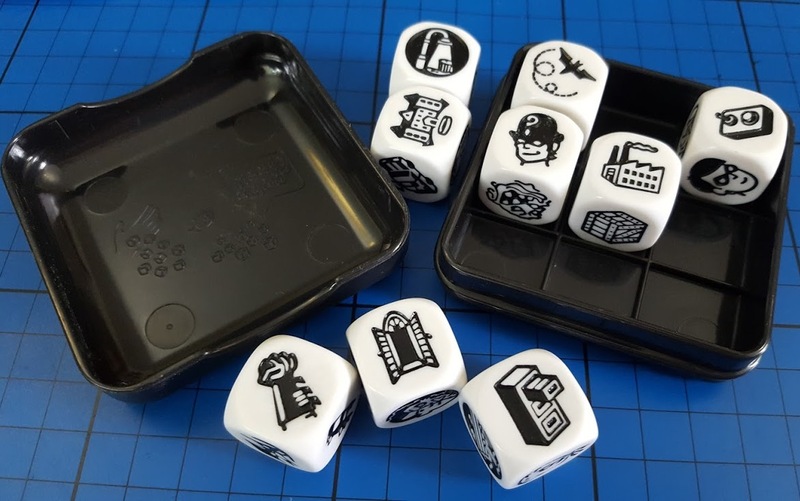 There are almost as many ways to vary play as there are possibilities on the story cubes. We like to take 3 story cubes as the start, middle and ending and follow them in the order we place them on the table. I thought it would take my 7 year old a long time to think of his stories, as he's usually incredibly methodical and frets about his own suggestions. Instead we've found he feels pressure to be quick, so blurts out his tale before he has chance to worry about it. This is increasing his belief in his own ability, allowing him to speak out confidently in a group. Skills which will really benefit him in his schoolwork and life. 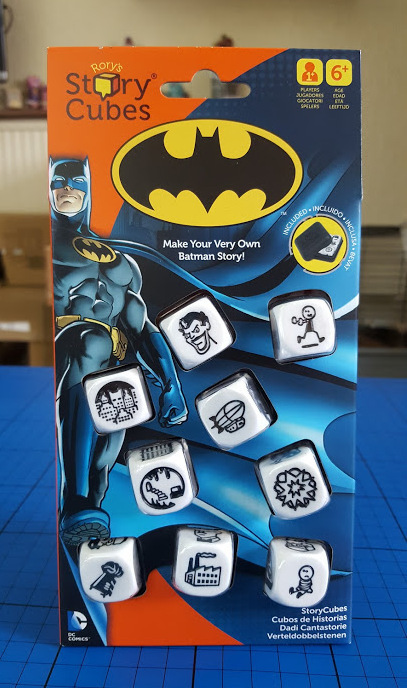 Rory's Story Cubes Batman edition are available to buy now instore or online on Amazon rrp £11.99. If you aren't so keen on Batman, there are also Moomin Story Cubes (£11.99). For more general stories try Action Story Cubes or Voyages Story Cubes (£9.99 each) or Original Story Cubes (£9.99). Larger sized cubes for large groups and people with less effective fine motor skills or eyesight are also available priced £19.99. I love this. They are great to get the thinking cap and encourage children to do story telling.